The beginning of the end for Honest Ed's was July 2013. Now, the end is nigh. When Ed Mirvish passed away in 2007, I first shared my memories of the Toronto institution at Bathurst and Bloor. My grandmother loved Ed Mirvish and his discount store. She dragged me there many times and always glowed when scouring the place for bargains. I loved the signage and posters throughout the big barn. That place was magic. The very first time I rode the subway by myself was to attend a school near Bathurst and Bloor one day a week in grade five. I'd get off at Bathurst station and walk from there. The lights of the Honest Ed's sign alway put a smile on my face. I just loved knowing it was there. The store is slated to permanently close tomorrow. It's the end of an era, Toronto. I lived in an apartment in the Annex for many years. Thanks to Honest Ed's I was able to furnish and stock much of that apartment and still live like a king. Thanks to Honest Ed's the apartment in no way resembled a royal palace, but it was a comfy home. I still talk about the best winter jacket I ever owned that I purchased from Ed's for a mere $25 - a jacket that easily rivaled others four or five times the price. I always enjoyed going into Ed's and I loved how that magnificent sign lit up the Bathurst / Bloor intersection. Alas another piece of Toronto's history disappears and with it a piece of Toronto's heart and soul. Visited the store on Dec. 17, not too many deals. Couldn't make it till Dec. 27. Opened the door to find everything basically gone. SHOCKED!!! 2nd Floor Mens Dept, GONE! not even a pair of socks. Basement, hardware, GONE! not even a mousetrap. 3rd floor CLOSED. not even a pair of insoles. 1st floor Grocery dept GONE! not even a can of beans. Can someone explain what happened in a span of 8 days that the entire store became empty. Saw the 75% sale but in 8 days u sell basically everything. The 75% wasn't even advertised in EDS last flyer, just on the window display. So disappointed. Anyone get any good deals? PS The son seemed to be more concerned with the Theatre business than the old Mom & Pop store that catered toward the complete opposite of the theatre people. 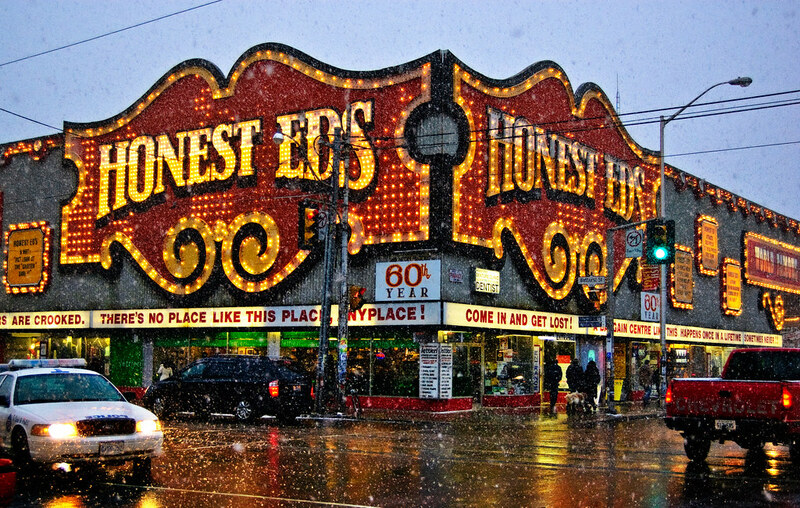 Honest Ed was a Canadian icon & so was that corner. Sam the Record Man a few years back, now Honest Ed's. These stores were one of kind. Oh Toronto what have u become??? My parents went to Honest Ed's often when they first moved to Canada. Back in October when my brother was in town, we went to Honest Ed's for old times sake. It was great to go back and brought back lots of memories. I remember going with my mom in the late 60's to pick up 2 Coleman coolers Ed had on sale. Got to skip school, took the Subway in from Warden all to save a few dollars, which were tight at that time. When you look at the staff loyalty and the living Ed's employees were able to make working there, you just don't see that with the Dollarama's or Buck or 2's that have taken the discount market from Ed' s. The corps are all profit/share holder driven only. Sad. My first ever action figure (a batman with grappling belt from 1989's Batman) came from Honest Ed's and ever since then the store has had a place in my heart. I even have a print of the iconic sign hanging on my living room wall, despite not even living in Toronto anymore. I drove by Honest Ed,s yesterday and it looked strange seeing the windows papered over with the closed signs. Like many it has been over 20 years since I've been in the store. Also 2016 saw the end of the Brunswick House. Ed Mirvish will be missed. Heres a post on how Ed Mirvish was a quintessential creative entrepreneur of our time!